Well it's October which mean Halloween is right around the corner. 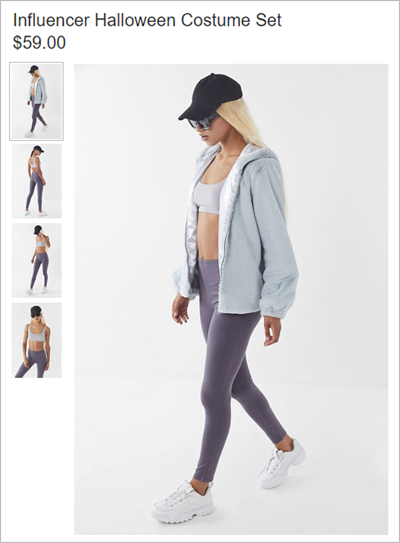 And to celebrate, Urban Outfitters has decided to promote and sell a costume to be your own influencer. It's never great when your industry gets spoofed like this and to be made fun of. But you know, I've done social media marketing for over 11 years now and I remember pretty clearly around 2010, 2011 there were lots of jokes about social media. Since then, the industry has been validated. Billions and billions of dollars now get spent on social channels. And if you've ever gone out with anyone under 35 years old, you know how immersed they are in the social channels on their phone. So I consider this in some ways, a watershed moment where influencer marketing is well enough known to be a Halloween costume that people will understand. And at the same time, if we focus on the good being done in influencer marketing, and yes, there's some bad influencer marketing just like there's bad social media, and even some bad television advertising. But if you focus on the good stuff, the stuff that's driving real business results, being well known enough for the world to understand what you do for a living, is by and large a good thing. So if somebody dresses as an influencer this year, don't take it too personally if you actually do influencer marketing for a living. Know it's a validation of our industry. We'll keep working on driving real business results and you dress as whatever you want this Halloween. Trick or treat.